Heat Exchangers WA is pleased to announce this year’s customer satisfaction survey results. We conduct this survey every year for the purpose of self-regulation and improvement. This year we achieved an overall customer satisfaction rating of 8.2 on a scale of 10. “Service is our Passion”, so I would expect nothing less than an 8.5/10, well done team! What really makes me happy though is how the market perceives our parts and workmanship quality, especially seeing most of our work involves the supply of NON-OEM parts which really are fantastic value. The overall rating is the average score in 3 core components of our value proposition as shown in the image below. These components are ‘Service’, ‘Quality’ and ‘Price’. A score of 8.5 in ‘Service’ shows that HEWA walks the talk when it comes to having a slogan of “Service is our passion”. We make sure that each engagement we have with you and each product/service we provide is in line with our company’s motto. 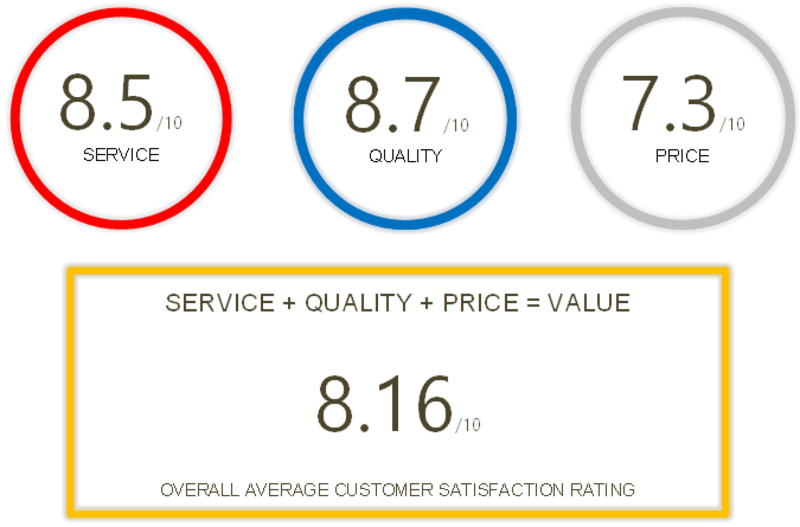 A score of 8.7 in ‘Quality’ means that our customers appreciate and value the quality of our products. This is no doubt the result of efforts made by our suppliers, like Evapco and Kelvion, and our dedicated workshop team which is continuously striving towards excellence, three shifts a day. Finally, a score of 7.3 in ‘Price’ indicates that our pricing is competitive. Our main objective is to reduce the lifecycle cost for you by providing you with the products and service of highest quality which ultimately reduce the frequency and cost of maintenance over the life of equipment. That being said, we are aware that sometimes pricing becomes the key decision point while quality and life cycle cost becomes secondary. In such scenarios, we can offer value engineered solutions to optimize the price and quality to a point that satisfies your needs. 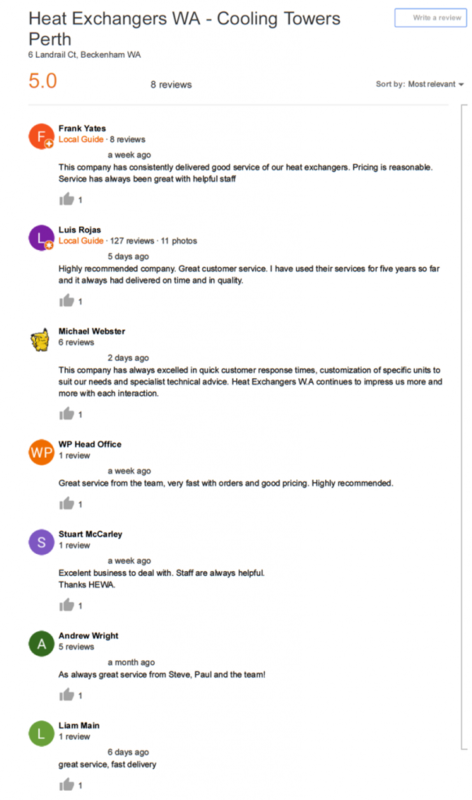 Some of our clients even went a step ahead and rated our company on google. Below is a snapshot of how they have rated us and what they have to say about us. Thank you to all who participated in our customer satisfaction survey. We value all business from you and with feedbacks like this survey, we are encouraged to strive for continuous improvement in our service, quality and price for you. Is Your Fouled Heat Exchanger Costing You? Why Do Your Gaskets Fail?